Police are investigating after a headless human torso was discovered in a suitcase in San Francisco, Calif. on Jan. 27, 2015. SAN FRANCISCO (KGO) -- San Francisco police are investigating whether the torso found in a suitcase is that of a close friend of the person of interest in the case. Omar Shahwan was last seen seven days before the suitcase was found. His parents filed a missing persons report on Tuesday in Vallejo. The possible victim was a close friend of Mark Andrus, who was taken into custody Friday night at a public housing development in San Francisco's Tenderloin neighborhood. 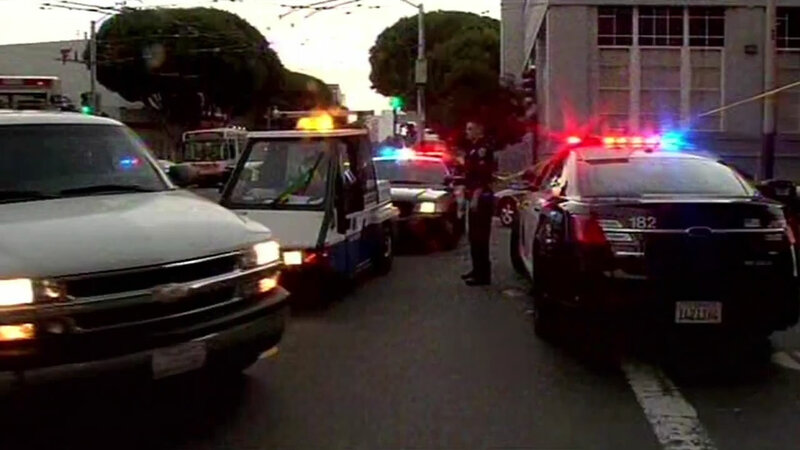 "We're hoping to identify the victim," said SFPD Chief Greg Suhr. "That's going to help us down the road. We haven't positively identified the victim yet." They once roomed together at the Hotel Krupa on Jones St. The two often visited Mark Keever, who spoke with ABC7's Carolyn Tyler on Tuesday. Andrus was arrested on Saturday after visiting Keever at his apartment. A police source says Andrus, who came out covered with a sheet, was wearing the same clothes in the security videos. They showed him lugging a suitcase, reportedly the same one that was found with the body at 11th and Mission streets. San Francisco police released surveillance video showing 59-year-old Mark Andrus dragging luggage down a sidewalk near where body parts were found stuffed in a suitcase. A police source says Andrus also had Shahwan's ID card when he was detained. But police had to let him go Tuesday night when prosecutors said they didn't have enough evidence to charge him. "Very tough case," said former SFPD homicide inspector Joe Toomey. "From what I know, they don't even know the identity of the victim. The main thing is to try to find out who this person was." The medical examiner already has DNA from the body. Now they need DNA from Shahwan's parents. "Get DNA samples from the missing person's parents or relatives and they can develop profiles and have the scientists determine whether they're relatives to the deceased person," Toomey said. So far police have security videos and a suitcase with a headless torso, a person of interest and a possible victim. Still missing -- the crime scene. There is one. It's just that police have yet to find it.